↑ Loshon, Charles A.; Beary, Katherine E.; Gouveia, Kristine; Grey, Elizabeth Z.; Santiago-Lara, Leticia M.; Setlow, Peter (March 1998). "Nucleotide sequence of the sspE genes coding for γ-type small, acid-soluble spore proteins from the round-spore-forming bacteria Bacillus aminovorans, Sporosarcina halophila and S. ureae". Biochimica et Biophysica Acta (BBA) - Gene Structure and Expression. 1396 (2): 148–152. डीओआइ:10.1016/S0167-4781(97)00204-2. ↑ Madigan M; Martinko J, संपा॰ (2005). 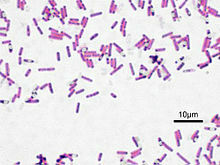 Brock Biology of Microorganisms (11th संस्करण). Prentice Hall. आई॰ऍस॰बी॰ऍन॰ 0-13-144329-1.